Do you need the perfect gift for soon-to-be newlyweds that is way more fun than a crockpot? Most wedding-related gifts focus on domestic items for the marriage part, but what about the honeymoon?! THAT's where the adventure really begins! The new Mr. and Mrs. will love having a bit of swag that let's the world know they are on a very special trip of a lifetime. It's amazing how much nicer strangers are to newlyweds on their honeymoon, because whether one has had a honeymoon or not, few people are immune to the romantic magic associated with this particular life event. Having the right accessories helps get that message across. Our fun Honeymoon Package is a delightful collection of tastefully fun essentials to help the new lovebirds celebrate their "Just Married!!!" vacay in style. Finely-crafted metal luggage tags with beautifully engraved "Mr." and "Mrs." notations will make luggage (or backpacks, if that's how they roll) easily identifiable, while also providing a lovely reminder of their new marital status. The companion "Mr." and "Mrs." Coozies will ensure that no one confuses which drinks are theirs when the happy couple is too busy gazing dreamily into each other's eyes to keep track of their cold bevies by the pool. For those romantic honeymoon outings, there's a fun drink jar with the message "Eat, Drink & Be Married", featuring a straw-ready lid to make this the ideal spill-resistant "go-cup". And to carry all this great stuff, there's a "wifey" tote bag made from durable jute - perfect for a day at the beach, a stroll in the city, or just carrying essentials out to the jacuzzi on the terrace. A cute, clear vinyl zippered Cosmetic bag also marked "wifey" is included for keeping toiletries and other small essentials organized. UNIQUE GIFT IDEA FOR NEWLYWEDS - Perfect as a Bridal Gift, Engagement Gift, Wedding Gift, Bachelorette party gift, Bridal Shower gift, or even a Second Honeymoon gift. 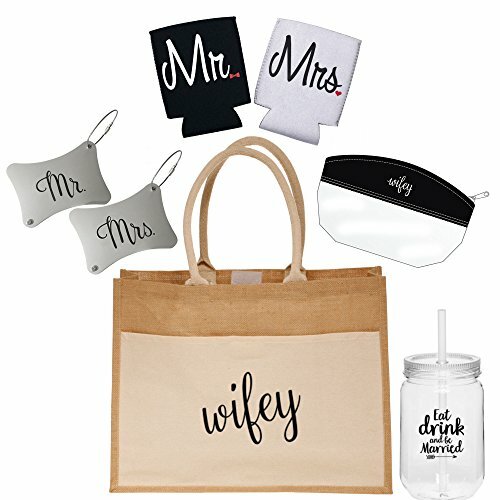 INCLUDES 7 HONEYMOON ESSENTIALS - "wifey" Jute Tote Bag, "Mr." and "Mrs." engraved metal luggage tags, "Eat, Drink & Be Married" drink jar with straw, "Mr." and "Mrs." Coozies for 12 oz. cans or bottles, and a "wifey" clear vinyl Cosmetic Bag. A FUN GIFT of several specially-designed items to help the happy couple celebrate their new marital status on their special trip. STYLISH, HIGH QUALITY JUTE BAG carries all items, plus other essentials for a romantic day out. SATISFACTION GUARANTEED - If you are not happy with your purchase for any reason, we will issue a full refund. If you have any questions about this product by Wine Wraps LLC, contact us by completing and submitting the form below. If you are looking for a specif part number, please include it with your message.